An 11-run fifth inning propelled the No. 2 seed Samford Bulldogs to a 14-4 victory over No. 5 Mercer, winning the Southern Conference baseball tournament title on Sunday. 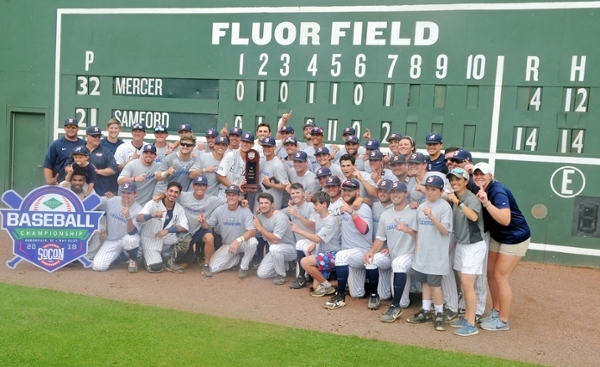 Samford claimed the SoCon Baseball Championship presented by Holston Gases at Fluor Field in seven innings when Branden Fryman launched a two-run, walk-off home run to invoke the mercy rule. Samford (36-24) earned the league’s automatic bid to the NCAA Regionals. Regional hosts will be announced Sunday at 7:30 p.m. (CT) on NCAA.com, with regional pairing announcements coming Monday at 11 a.m. (CT) on ESPNU. Samford will host a watch party for the NCAA Tournament Selection Show Monday in the Coca-Cola Hospitality Suite in the Pete Hanna Center. Fans and media are welcome to come and share the experience with the team as it learns where it will travel for an NCAA Regional next weekend, as well as its first-round opponent. This marks the second time Samford has earned a bid to the NCAA Tournament and the first since 2012. The Bulldogs’ Brooks Carlson earned the Walt Nazdak Most Outstanding Player award, going 3-for-4 with two RBIs and one run scored in win. Samford led the way with four all-tournament members in: Samuel Strickland (starting pitcher), Wyatt Burns (relief pitcher), Anthony Mulrine (catcher) and Carlson (designated hitter). Samford’s Kyle Stuart earned the Pinnacle Award, which is given to the student-athlete with the highest GPA from the championship team. Mercer has its season end at 38-22. The Bears scored four runs on 12 hits from eight different batters, but their mistakes ultimately did them in, as they committed a pair of costly errors, hit a batter and threw a wild pitch. Mercer’s Jackson Ware (second base) and Trey Truitt (outfield) were named to the all-tournament team, with Truitt becoming just the second player in league history to earn the honor three times, joining former Samford standout Heath Quinn (2014-16). Samford racked up 14 hits, boasting four players with two or more hits led by a two-hit, three-RBI afternoon from shortstop Branden Fryman. Samford’s Jack Rude (1-1) picked up his first win of the season, entering in the fifth inning and yielding just one earned run while striking out three batters. Mercer’s Austin Cox (7-4) was tagged with the loss, throwing 4.1 innings and allowing eight hits and five runs while striking out four batters. All-SoCon first-team member Robert Broom, who was battling a blister on his pitching hand, walked in one batter before being pulled from the game. Mercer’s Alex Crotty put the Bears ahead in the second inning when he doubled to score Le Bassett. After Samford scored a run to tie the game at 1-1, Bassett hit a solo shot in the fourth to give Mercer a one-run advantage. Brandon Michie doubled in Alex Hanson as the Bears looked primed to force a decisive second game on Sunday. After Max Pinto singled and advanced on a wild pitch in the fifth, Fryman singled to score Pinto and was brought in by Troy Dixon as Samford knotted the game up at 3-3. The Bulldogs would load the bases as Mercer’s Christian Vann walked a batter, hit a batter and gave up consecutive RBI singles to give Samford a 7-3 lead. The Bulldogs would capitalize on Mercer error, scoring three runs when Pinto singled and advanced to third, clearing the bases after the left fielder misplayed the ball. Carlson capped off the 11-run inning with two-run double to center field. The Bears shows a little life in the seventh, scoring a run and putting runners on the corners with two outs, but Rude induced a groundout to end the Mercer rally. Pinto singled to bring up Fryman who smacked the two-run homer to left field, putting the Bulldogs up by 10 and ending the game in just seven innings. For quick score updates, breaking news and links to all of your favorite articles featuring the Bulldogs, please follow @SamfordBaseball and @Samford_Sports on Twitter.